Smaller and bigger – why does it matter? If a smallholder farmers in Central Africa earns an extra dollar, what kind of food would the farmer buy? The answer is - starchy staple food, fruits, meat and vegetables. If compared to a guy from a richer country like the United States, this guy would rather spend his extra dime on beverages and tobacco or dine out in a junky fast food chain to enjoy a cheeseburger with a diet coke. “The Afrint Project” is a study by from Lund University; Agnes D. was explaining in the Breakout session that her project team tries to find out the challenges faced by staple crop intensification in relation to farm sizes and urbanisation. The study shows that staple crop amounts sold remain very low in Sub-Saharan Africa, with only 50% of the growers of maize, cassava, and rice would sell their farm produce. Farmers in the hinterland tend to keep majority of staple food for their subsistence use. There is an agrarian transformation undergoing in Africa: intensive grain production by male headed households; commercial diversification from staple crops to vegetables in areas close to urban markets, and income diversification out of farm-related income. Farmers in peri-urban area engage more in off farm activities and there is growing dynamics between urban and rural areas that food from rural farmers can compensate lack of urban food security. 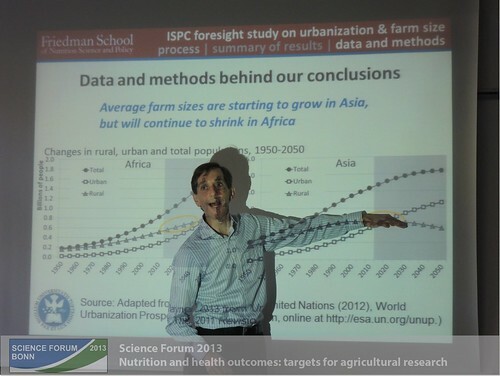 Farm size distribution is like a balloon According to the foresight study presented by Will Masters from Tufts Undiversity, there are two extremes to define growth pattern of farm sizes in Africa, and it varies from country to country. In East Africa countries, average area of family farms seems to be decreasing at least for the next 2 decades because of the rising number of farm workers due to natural population growth and urbanization. In some marginal areas in Sub Saharan Africa, there is a tendency to retreat into subsistence, withdrawal from technology use, shrinking household sizes. In contrast, the big invested farms keep expanding at the expense of shrinking land available for the smallest. These bigger farms use hired managers to supervise hired labors. Indeed, farm size has strong link with farm income, level of intensification, mechanization, or commercialization. Will Masters presented on ISPC Foresight Study Results Fight for soil and water The UN Food and Agriculture Organisation (FAO) report found that 25% of the world's farmland was now "highly degraded" with soil erosion, water degradation and biodiversity loss. In many locations the decline in land availability has led farmers to draw down soil and water resources in order to meet the subsistence obligations of rural households. Facing the growing population, shrinking farm sizes, degrading natural resources and less market access in the hinterland or marginal land, I think there is an urgent need for disseminate techniques suited to farmers’ new situations, especially for the marginal smallholders and the women farmers. ”Small and women are beautiful” According to Farmer’s Weekly, Africa’s food security problem can only be overcome by working in partnership with its smallholder farmers or family farms. More than three-quarters of Africa’s population is engaged in agriculture and related activities. The vast majority are women, mostly on small farms of 2 hectares or less. The women who produce most of Africa’s food are particularly disadvantaged economically and socially. They aren’t considered heads of households, rarely have land title rights and their interests are all too often overlooked by traditional financial institutions. Learn from the past It was discussed in the session that existing field data about farm sizes, farming systems, gender implications and linkage between population, agriculture, health and nutrition outcomes is not consolidated. There is a whole bunch of research institutes from Europe, projects from international development agencies, World Bank or UN are working in Sub Saharan Africa on food security programs or research. We always say Research For Development (R4D), the question is, there is no platform for researchers to share the existing data for future strategic plans. Everyone is working on his own world. We need knowledge and innovation to carry on development work in Global South, but we also need to learn from the past – the importance of assessing project outcomes and not repeating the same game again and again.